The techniques used to tattoo our bodies have gone a long way in the past 5,000 years. Tattooing techniques used by ancient tribal cultures were often carried out by a process known as scarification. This involved the scratching, cutting or branding of designs into the skin, and then applying primitive ink, made from ashes and other local minerals, which was rubbed into the open wounds. Some tribes used primitive tools such as pointed sticks or sharp animal bones which were used to ‘hand-tap’ the ink into the skin. The Japanese used a hand-injecting technique known as Tebori, which used tools made of sharp bamboo. Traditional Hawaiian tattoos are created using hand carved bone or tusk. Needles and awls, (tools for making holes) fashioned in clay were also employed by many tribes. All these ancient tribal processes have two things in common. Firstly, the tattooing process took an inordinately long time to complete, as the ink was inserted one ‘tap’ or one chiseled ‘gouge’ at a time. Secondly, the process was extremely painful for the recipient. Although the traditional Japanese and Hawaiian hand tap methods can still be found in use today, for the tattoo world at large, tattoo processes and techniques have changed significantly since late 19th century. The forerunner of today’s electric tattoo machines was invented in 1891 in London by Samuel O’Reilly when he modified the electric autographic printer, which was an engraving machine, invented by Thomas Edison to engrave hard surfaces. O’Reilly adapted the American’s machine by changing the rotary-driven electromagnetic oscillating unit to drive a tattoo needle. This used a single electric coil, and then in 1899, another Englishman, Alfred Charles South, built the first twin-coil machine which is the predecessor of today’s machines. These days there are essentially two types of motor used to drive the needle, namely, the rotary machine, which has a rotating circular bar that moves the needle up and down; and the magnetized coil machine, (an electromagnet), which is operated by a foot pedal that sends direct electric current to the needle. The modern day tattoo machine delivers ink to the skin by way of needle(s) that are attached to a metal bar attached to an oscillating unit. This unit drives the needle(s) in and out of the skin at between 50 to 150 times per second. There can be between 3 to 25 ‘ends’ to a needle as different types of needles are used for different tattoo effects. Fewer ‘ends’ are used for outlining, and more ‘ends’ for shading or coloring. So basically, modern tattoo machines consist of an electric motor, a foot pedal similar to those on sewing machines, a tube system to draw the ink and a needle with a variable number of ‘ends’ that can deliver high-speed, relatively painless punctures to the recipient’s skin. In modern studios, such as All Day Tattoo, the tattoo machines are the latest state of the art models and the needles are used only once and come individually sealed in sterile packaging. The tattoo artist thoroughly washes his hands and uses gloves at all times. After use, the needles are disposed of hygienically and all the tattoo equipment is properly sterilized in an autoclave unit. 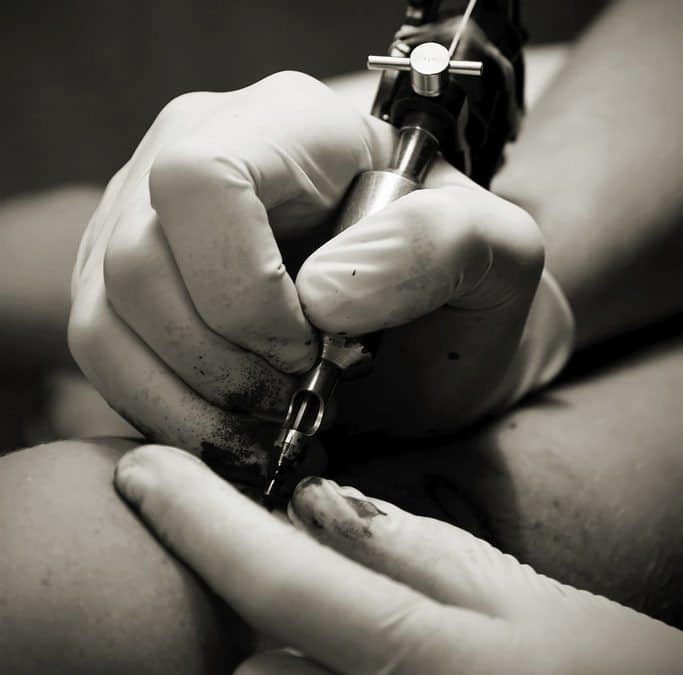 In order for tattoos to remain permanently in your skin, the ink must be inserted into the dermis, which is approximately one millimeter under the surface of your skin. If the ink is only injected into the outer layer, (epidermis), it will fade away as your skin sheds and renews itself. Strange to relate, tattoos needles don’t work the way most people think they do. A common and reasonable assumption is that the needles inject ink into your skin. What actually happens is that when the needle punctures your dermis, your immune system is fooled and goes into overdrive in an effort to eject the invader and close the hole up. In doing this, ink is sucked into the dermis from the ends of the needle and becomes trapped inside cells that are supposed to destroy the ink. It is for this reason that the ink will remain there forever, permanently trapped in these cells. The fast oscillating machine will make thousands of tiny pin pricks into the skin, creating thousands of tiny wounds, and the cells in the dermis respond by dragging the ink down into it. So when you look at a finished tattoo, you are actually looking at a design or picture lying one millimeter down in the second layer of the skin. These days, most tattoo artists buy their ink from ink manufacturing companies that create their inks by using their own, often secret formulas. Inks used by less reputable studios may be bought from dubious sources, and can sometimes contain harmful elements. Substandard ink, often made in China, can occasionally lead to serious side effects for the wearer. At All Day Tattoo in Bangkok, we only use the highest quality inks, which are imported from the finest branded tattoo ink suppliers in the USA. We only ever use an ink once and if you would like to pay a visit to our studio we can show you the inks we use and help you choose the colors before we commence your tattoo. Lining – This is the technique used to draw the basic outline of the tattoo design on your skin. A small, round group of ‘ends’ is usually used for this process, and lines can vary from thin to quite thick, depending on the number of passes made with the needle. Shading – Shading is mainly done with black ink and different techniques are used to create darker or lighter shades. One widely used technique can only be carried out by an expert artist who applies varying pressures on the needle to achieve the light and dark effects. Other techniques involve the mixing of white ink with black ink to achieve various shades. Shading is a highly skilled technique and it is easy to get it wrong. Experienced and accomplished artists, such as those we have at All Day Tattoo in Bangkok, can create some remarkable shading effects for you. Coloring – Again the coloring requires special skills and the artist will ‘fill in’ areas of your tattoo design with color. Various different techniques are used, such as a group of overlapping circles to fill the area, or the artist may sweep needles over the skin using a similar ‘pressure’ method used in shading to create dark and light colors. Lettering – Tattoo styles may go in and out of fashion, but the one ‘staple design’ of the tattoo industry is lettering. Through the ages, people have always wanted to tattoo people’s names, or gods, or mystical beings, or quotations on their body. There are two obvious drawbacks in having letters tattooed on your body. The wearer may no longer wish to have the name of an ex-loved-one on their body, and there is the ever-present danger of words being misspelled. Again, not all tattoo artists can embellish beautiful lettering on your skin as it is a specialized skill that requires a lot of experience and concentration. Fortunately, we at All Day Tattoo in Bangkok are well qualified to undertake lettering as a part of your tattoo. We can also help to ensure 100% that there are no spelling mistakes. Why not try All Day Tattoo in Bangkok? If you are thinking of having a tattoo and would like to discuss any of the issues contained in this article, or you simply want some general tattoo advice, why not click the button below to arrange a friendly, completely obligation-free consultation with one of All Day Tattoo’s team.